Kristina Michelle Reed has been selected to the Northern California Super Lawyers list for the 6th year in a row. Each year, no more than five percent of the lawyers in the state are selected to receive this honor. "The objective of Super Lawyers’ patented multiphase selection process is to create a credible, comprehensive and diverse listing of outstanding attorneys that can be used as a resource for attorneys and consumers searching for legal counsel." Kristina Michelle Reed has been selected to the Northern California Super Lawyers list for the 4th year in a row. Each year, no more than five percent of the lawyers in the state are selected to receive this honor. Super Lawyers is a rating service of outstanding lawyers from more than 70 practice areas who have attained a high degree of peer recognition and professional achievement. The annual selections are made using a patented multiphase process that includes a statewide survey of lawyers, an independent research evaluation of candidates and peer reviews by practice area. Each candidate is evaluated on 12 indicators of peer recognition and professional achievement. “[The Super Lawyers selection process] is a comprehensive, good-faith and detailed attempt to produce a list of lawyers that have attained high peer recognition, meet ethical standards, and have demonstrated some degree of achievement in their field." "Suffice to asay, the selection procedures employed by [Super Lawyers] are very sophisticated, comprehensive and complex." 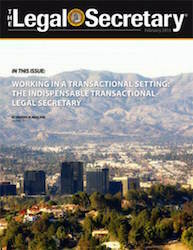 Kristina Reed ’s article, Working In A Transactional Setting: The Indispensable Transactional Legal Secretary, was featured in the February 2015 edition of The Legal Secretary. Kristina provided advice to legal secretaries working in a transactional legal setting. Follow this link to read the Article. Kristina M. Reed Recognized as “Best of the Bar 2014” by the Sacramento Business Journal. Kristina M. Reed was recognized as “Best of the Bar 2014” by the Sacramento Business Journal. The Sacramento Business Journal recognized local attorneys who have been nominated by their peers and then vetted by a panel of 20 well-known lawyers on a peer-review panel. Kristina M. Reed Presents Seminar - Commercial Leasing: Nuts & Bolts and Pitfalls. Kristina Michelle Reed has been selected to the 2014 Northern California Super Lawyers list. Each year, no more than five percent of the lawyers in the state are selected by the research team at Super Lawyers to receive this honor. Super Lawyers is a rating service of outstanding lawyers from more than 70 practice areas who have attained a high degree of peer recognition and professional achievement. The annual selections are made using a patented multiphase process that includes a statewide survey of lawyers, an independent research evaluation of candidates and peer reviews by practice area. The result is a credible, comprehensive and diverse listing of exceptional attorneys. Kristina M. Reed Recognized as “Best of the Bar 2013” by the Sacramento Business Journal. Kristina M. Reed was recognized as “Best of the Bar 2013” by the Sacramento Business Journal. The Sacramento Business Journal recognized local attorneys who have been nominated by their peers and then vetted by a panel of their peers. Kristina Reed was quoted in today's edition of the Sacramento Business Journal. Kristina provided advice to commercial tenants on renewing their commercial leases. For the second year in a row, Kristina Michelle Reed has been named to the Northern California Rising Stars list as one of the top up-and-coming attorneys in Northern California for 2013. Rising Stars are 40 years of age or younger or have been in practice for 10 years or less. Each year, no more than 2.5 percent of the lawyers in the state receive this honor. Attorneys selected for inclusion in the list of Super Lawyers and Rising Stars are nominated by their peers before undergoing "rigorous" evaluations in a number of areas of "peer recognition and professional achievement," according to Super Lawyers selection process. The objective, the magazine says, is to "create a credible, comprehensive and diverse listing of outstanding attorneys." Recognition is based on surveys of approximately 52,000 active lawyers in Northern California, independent research by Super Lawyers magazine, and review and recommendation by practice-area panels of top lawyers. Law Office of Kristina M. Reed Sponsors Dreamers. Welcome. Competition. The Law Office of Kristina M. Reed is proud and excited to take part in the latest opportunity for small business growth in Downtown Sacramento by providing legal services to the winner of the Dreamers. Welcome. Competition . "Helping entrepreneurs achieve their dreams by providing an innovative small business the foundation needed for success is the exact reason that I opened the Law Office of Kristina M. Reed" says Kristina Reed. Winners of this Competition receive a prize package worth $125,000 to open their businesses in Downtown Sacramento. Kristina Reed has been named as an Adjunct Professor by Alliant International University, California School of Forensic Studies. Ms. Reed will teach Legal Research to the graduate students in the Clinical Forensic Psychology PsyD Program. “ California School of Forensic Studies faculty are some of the most experienced, qualified faculty in clinical forensic psychology and forensic studies, both in the U.S. and internationally. Expertise ranges from presenting ground-breaking research to regularly and consistently working with family courts, police departments, and prisons. Faculty include an Italian federal police officer, an expert in terrorism and risk assessment with federal law enforcement experience, a Senior Superintendent for the South African police, and a former consultant to the FBI's Unabomber Task Force.” Kristina Reed is honored to be included amongst such esteemed faculty and she looks forward to bringing her real-world knowledge of legal research to the classroom. Kristina Reed a member of the Sacramento Business Journal's expert panel on small business issues, was quoted in today's edition of the Sacramento Business Journal. Kristina provided advice to small businesses on the selection and preservation of a business's trade name. Kristina Reed was nominated by the Sacramento Business Journal as one of the top 40 business leaders under 40 due to her influence on Sacramento businesses. Kristina Reed was selected by the Sacramento Business Journal to be a member of its is expert panel on small business issues. Kristina's advice to small businesses on the selection of a business attorney was featured in the Sacramento Business Journal. Kristina Michelle Reed has been named to the Northern California Rising Stars list as one of the top up-and-coming attorneys in Northern California for 2012. Rising Stars are 40 years of age or younger or have been in practice for 10 years or less. Each year, no more than 2.5 percent of the lawyers in the state receive this honor. Attorneys selected for inclusion in the list of Super Lawyers and Rising Stars are nominated by their peers before undergoing "rigorous" evaluations in a number of areas of "peer recognition and professional achievement," according to Super Lawyers selection process. The objective, the magazine says, is to "create a credible, comprehensive and diverse listing of outstanding attorneys." Recognition is based on surveys of approximately 52,000 active lawyers in Northern California, independent research by Super Lawyers magazine, and review and recommendation by practice-area panels of top lawyers. Kristina Reed has been appointed to Heald College's Paralegal Program Advisory Board. Heald College only invites select legal professionals to serve as Advisory Board members. As an Advisory Board member, Kristina Reed assists Heald College with the development of the paralegal program curriculum.